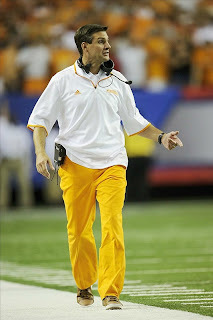 Derek Dooley's latest fashion statement: the oversized, untucked zipper polo shirt. Tennessee head football coach Derek Dooley made two statements Friday night in the Chick-fil-A Kickoff Game. One was leading the Volunteers to a 35-21 beating of North Carolina State. The other was yet another football fashion statement in the tradition of the Tennessee Airflo hat and the orange pants - the oversized, untucked zipper polo shirt. Obviously, being on the Hot Seat isn't stopping His Hairness from being fashion forward. He's also sporting an additional button-down polo under the zipper polo, which is an obvious Total Frat Move. Dooley makes sure to cover all the corners of football fashion. 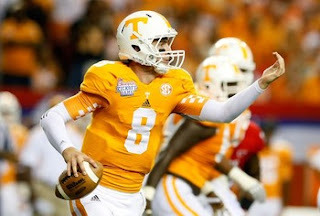 Too bad he couldn't do something about that compression shirt Vols QB Tyler Bray was wearing. Underarm checkerboard? Somedays, I don't even think Adidas is even trying. First Friday night of the college football season. Enough reason to try an open thread again. Post away! Game Day Goulash: Chris Petersen, Andrew Maxwell, and more. A Pirate Looks at 30-6. Things to Do in Dallas When You're 'Bama. Florida State is most "overhyped" team in the country. Georgia gives bulldog Russ "battlefield promotion" Uga IX. Photo via The Atlanta Journal-Constitution. 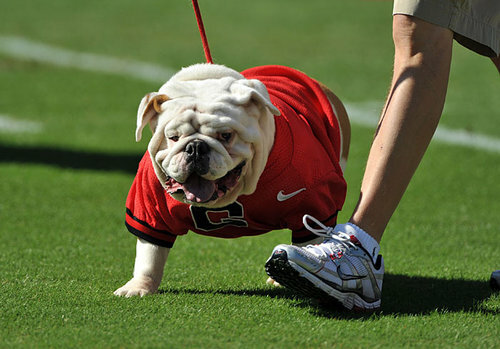 Russ, the bulldog that has served as interim mascot for Gerogia for the past two seasons, has been officially been given the title of Uga IX. The school refers to this as a "battlefield promotion." 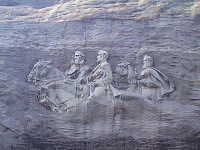 Russ first took the interim job after the passing of Uga VII in 2009, and again after the passing of Uga VIII. A brown patch on his back and ear most probably kept him from the job until now, as the Ugas are traditionally all-white. The official swearing-in ceremony for Uga IX will be on Sept. 15. Big Tentacles: Denard Robinson, Urban Meyer, Rex Burkhead, and more. Alright, Mr. Hoke. I'm ready for my spotlight. Ohio State is "bigger" with Urban Meyer. A Lion Eye profiles Illinois linebacker Jonathan Brown. Don't Go Away Mad (Just Go Away). Your lame Missouri "SEC Bound" fan video of the day. There's nothing like college football fans showing their love for their team with a lame song on YouTube. And some Missouri fans have done just that, singing about how the Tigers are "SEC Bound." Memo to Mizzou fans under 30: Don't gloat about football game that happened before you (or in some cases your parents) were born. Especially those that happened 45 years ago like the '66 Sugar Bowl against Florida. And if your cowboy duds make you look like a frakin Athens hipster c. 1985, don't even bother making a music video. Seriously, even Aggies know better than that. Covering Dixie Like Mildew: AJ McCarron, Nick Saban, Les Miles, and...it's college football season! The Wall Street Journal's Rachel Bachman and Ben Cohen look at how Nick Saban turned Alabama around. Aggies and Hogs are Jerryworld bound in 2014. Team Speed Kills looks at the wonderful world of classic SEC coaches pimping in commercials, including the legendary Bear Bryant "Have you called your mama today? 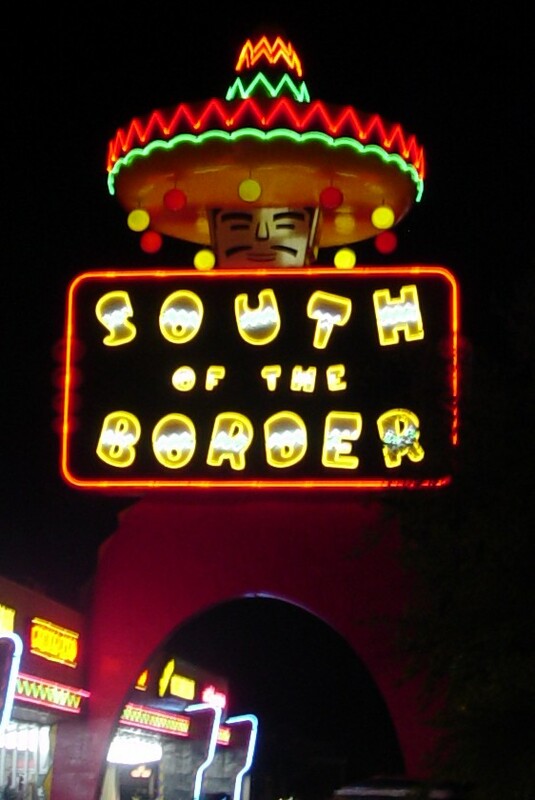 South Central Bell spot. Hurricane Issac pulls the plug on Oregon St. home opener. Hurricane Issac left the college football schedule in a bit of a mess along the Gulf Coast of Louisiana, postponing Texas A&M trip to Louisiana Tech. But Issac also is reeking some havoc in Corvallis, Oregon, of all places. Oregon State's season opener on Saturday was scheduled against Nicholls State, an FCS school located in Thibodaux, La. The storm put the kibosh on the Colonels' trip out west. "It's extremely unfortunate that we will not be able to make this trip," Nicholls State athletic director Rob Bernardi said in a statement. "With the lingering effects of Hurricane Isaac, we do not want to put any of our student-athletes or staff in danger, so at this point, we feel like it is best to focus on the safety of everyone, and we'll look into rescheduling the game at a later time." Oregon St. and Nicholls St. are looking at the chances of rescheduling the game, if possible. Big Tentacles: Nick Saban on Denard Robinson, Purdue, and more. A Lion Eye profiles Illinois defensive tackle Akeem Spence. 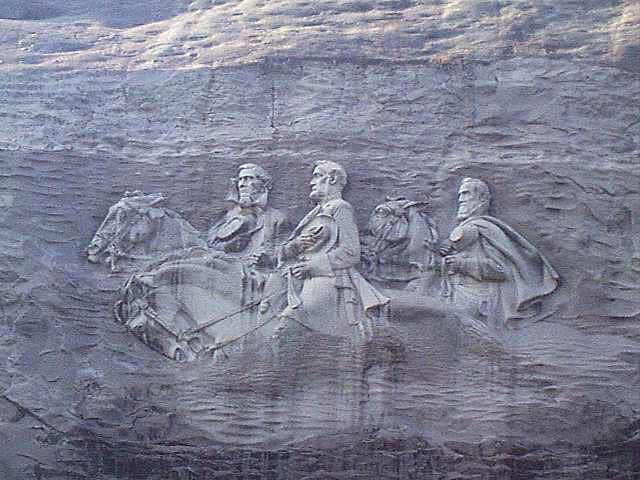 Covering Dixie Like Mildew: Zach Mettenberger, Mark Richt, Robert Lester, and more. Anchor of Gold's Christain D'Andrea sits down with one of Garnet and Black Attack's bloggers to discuss the season-opening showdown between Vanderbilt and South Carolina. Da'Rick Rogers admits to failing drug tests at Tennessee. Tennessee Tech wide receiver Da'Rick Rogers came clean about the events that led to his departure from the Tennessee Volunteers. Not surprisingly, they were drug related. UT’s substance abuse policy for athletes does not carry mandatory punishment for a first-time offense. Punishment for a second offense is a one-game suspension. A third offense may result in an indefinite or permanent suspension." So reading between the lines, Rodgers probably failed three drug tests, if is story is true. More than enough to make Vols head football coach Derek Dooley head to his own medicine cabinet for a couple of aspirin. Crossing the Atlantic: Dabo Swinney, FSU, Al Golden, and more. Clemson is "a work in progress." Maryland HC Randy Edsall on the Hot Seat? Florida State offensive line report. Hurricane Issac causes scheduling changes. The college football schedule has suffered its first casualties from Hurricane Issac as South Alabama's game against UT San Antonio has been moved back from to Saturday, and Texas A&M-Louisiana Tech has been rescheduled to Oct. 13. Big Tentacles: Brian Kelly, Urban Meyer vs. Jim Tressel, Andrew Maxwell, and more. Purdue suspension of the day. A Lion Eye profiles Illinois defensive end Michael Buchanan. Covering Dixie Like Mildew: Tyler Bray, LSU and Hurricane Issac, Shaq Roland, and more. Baylor QB Nick Florence will not try to fill RGIII's Superman Socks. Baylor starting quarterback Nick Florence has some big shoes to fill. Those would be the ones belonging to last year's Heisman Trophy winner Robert Griffin III, who now plays for the Washington Redskins. One thing that Florence will not apparently try to fill is RGIII's legendary Superman socks, as he goes for more normal dress sock fare. While it is good to hear that Florence seems to have a more down-to-Earth attitude, Bears fans are bound to be hoping that is on-the-field performance is at least good enough from keeping Baylor from crashing back to Earth. Big Tentacles: Montee Ball, Denard Robinson, Kevin Wilson, and more. Off Tackle Empire discusses the rare opportunity Illinois and Purdue have to win the Big Ten Leaders conference with the Ohio State and Penn State ineligible to win the division. A Lion Eye tries to debunk myths about Illinois such as former head football coach Ron Zook "leaving the cupboard stacked" with talent. A Lion Eye profiles Illinois running back Josh Ferguson. You're Arm's Too Short to Box With AIRBHG. Is Da'Rick Rodgers Tennessee Tech bound? Suspended Tennessee wide receiver Da'Rick Rodgers might be on his way out of Knoxville. Chris Low has reported that the oft-troubled Rodgers, suspended for the ever-popular "undisclosed violation of team rules," will transfer to Tennessee Tech. Since it plays in the FCS, Rodgers would be elligible to play in 2012, and not have to sit out the season. Covering Dixie Like Mildew: Les Miles, Derek Dooley, Alabama, and more. LSU will play South Carolina in the SEC championship game. Welcome to the Fallout: Jarvis Jones, SEC loyalty, Taylor Kelly, and more. Michigan is not a top ten team. I'm the Sun King, baby. With you I'll share my throne. Auburn center Reese Dismukes arrested for public intoxication, suspended. The last thing Auburn needed a week before a high-profile game against Clemson in the Georgia Dome was an player getting arrested. But that's what happened as center Reese Dismukes was arrested for public intoxication in the Loveliest Village on the Plain a week before the season opening Chick-Fil-A Kickoff Game in Atlanta. "Dismukes was arrested for public intoxication by Auburn police near Auburn Hardware in the 100 block of East Magnolia Avenue at 2:03 a.m. Saturday, according to the arrest report for the 19-year-old. Officers detained Dismukes after he appeared intoxicated. Dismukes did not resist arrest, according to the report. Dismukes was released on $300 bond, according to Lee County Sheriff online records. Lee County Sheriff Jay Jones said Dismukes was released mid-morning." Auburn head football coach Gene Chizik has already banhammered Dismukes, suspending him indefinitely. Welcome to the Fallout: Lane Kiffin talks SEC, Iowa, and...Cormac McCarthy? Walker on the Wild Side. No Conference for Old Men. Wide Right & Natty Lite enlists author Cormac McCarthy (or a facsimile thereof) for his 2012 season Big 12 predictions. From the "Things we all wish would actually happen" dept. Big Tentacles: Storm Klein, Illinois, and AIRBHG. A Lion Eye profiles Illinois offensive lineman Graham Pocic. Covering Dixie Like Mildew: John L. Smith, Georgia, Mississippi St., and more. Brewster new Miss St. WR coach. Tennessee WR Da'Rick Rogers suspended, probably won't be back. It's not a beautiful day in the Tennessee neighborhood today as the wide receiver Da'Rick Rogers has been suspended for the ever vague "undisclosed violation of team rules." Vols head football coach Derick Dooley expects that "Rogers won’t return to the program." "Dooley said he informed Rogers of the suspension on Wednesday and told the rest of the team before practice today. “There’s not one player on the team that we’re not prepared to go play without,” Dooley said." Rogers had previously been involved in the infamous "Bar Knoxville" brawl in 2010. Big Tentacles: Iowa, Illinois, and more. Illinois loses Dickinson for season. A Lion Eye profiles Illinois cornerback Justin Green. The Crimson Quarry looks at Indiana's running backs. Covering Dixie Like Mildew: A.J. McCarron, Knile Davis, Tyrann Mathieu, and more. Thank you're lucky stars, Honey Badger. Knile Davis is the best running back in the SEC. Red Cup Rebellion discusses how Ole Miss' continuing image problems surrounding the school's history during the battle for desegregation, and the Rebel fanbase's use of confederate imagery. This is for the answers that don't have any questions. Dawg Sports looks at the Georgia QB situation beyond Aaron Murray, including who would be in line to be starting QB next season if Murray decides to declare for the NFL Draft. Unquiet on the Western Front: Willie Lyles, Taylor Kelly, and more. Willie Lyles rears his ugly head again. Hedrick and the Angry Itch. Josh Nunes is an Absolute Magician, and new Stanford starting QB. Stanford QB Josh Nunes. Photo via ESPN. 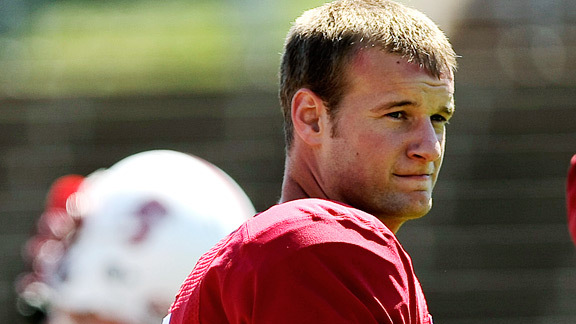 Stanford has found the replacement for the departed starting QB Andrew Luck. Redshirt junior Josh Nunes got the nod Tuesday to lead the Cardinal's offense in 2012, beating out Brett Nottingham. Nunes is a little philosophical about replacing arguably one of the greatest QB's in Stanford history. "The great thing is the path has been laid for how to be a successful quarterback here at Stanford," Nunes said, referring to Luck's career. "So, really, it's just following that pattern and emulating the kind of player that he was and the kind of person that he was here. I also got to realize I'm not Andrew Luck, and by no means am I trying to be exactly him. I'm trying to come out here and run this high-powered offense that we got and get it to the playmakers that we got." Nunes won't get too much time to reflect. After games against San Jose State and Duke, the new Cardinal QB goes from frying pan into fire as Stanford goes up against USC on Sept. 15. Fortunately for him, it will be a home game. Or should we say "Luck-ily?" And before you ask, Josh Nunes is not related to former Syracuse QB Troy Nunes, who really was an "Absolute Magician." The Northwestern football team was treated to a visit by members of the Navy SEALs. Treated meaning the team got their butts kicked as the SEALs gave the Wildcats a taste of Hell week on the shores of Lake Michigan. It's not every day players get smoked by some of America's finest. It will certainly be a learning experience they'll remember on and off the field. Covering Dixie Like Mildew: Nick Saban, South Carolina injuries, Knile Davis, and more. Arkansas Expats compares Arkansas quarterback Knile Davis to baseball Hall of Famer Reggie Jackson. Georgia tailback Todd Gurley is not like Trent Richardson. Minnesota pulls an Alabama, claims 1904 national championship. Oh, how cute! Minnesota has decided to pull an Alabama and claim a college football national championship title retroactively. The school has "updated" the Golden Gophers' college football record books to include a title it allegedly won in 1904. Well, actually, it was apparently decided in 1996 by the NCAA that it had won a title in 1904. Minnesota is just getting around to claiming it as its own. "Turns out the NCAA inserted the centenarian championship into its records book back in 1996, citing historical research by Richard Billingsley, a computer rankings guru. Billingsley has created a retroactive computer ranking for every season going back to 1869. A Minnesota athletics department staffer finally noticed the change this past winter and updated the school's records accordingly." This would be Minnesota's seventh "national title. That means Alabama is still in the lead of dubiously claimed titles with 36 14. Big Tentacles: Urban Meyer pushes, Ondre Pipkins returns, Andrew Maxwell, and more. I want to push you around. Don't mess with a Michigan Man. Norte Dame's Wood out for season. A Lion Eye profiles Illinois defensive tackle Glenn Foster. The Crimson Quarry takes a look at Indiana's quarterback situation. If you smell what Purdue is cooking. I need 50 dollar to make you holler. Arkansas-branded Pop-Tarts exist, but do not taste like bacon. From the "shocked, but not really" department comes news that Kellog's is coming out with NCAA-themed Pop-Tarts. Schools involved include Arkansas, Georgia, North Carolina, Michigan, and Florida, which will have their school logo or icon printed directly on the Pop Tart's icing. From the looks of the Pop-Tart boxes, it looks like all the Pop-Tarts will be of the same strawberry flavor, albeit re-branded with college-themed named like "Razorback Red"for Arkansas, or "Go Blue Strawberry" for Michigan. That means those with hopes for a Arkansas-branded bacon-flavored Pop-Tart are bound to be disappointed. And trust me, there are people who would go nuts over a bacon-flavored Pop-Tart. How about peach-flavored Georgia Pop-Tarts? Or peanut butter-flavored UGA Pop-Tarts, even? Or UNC blueberry Pop-Tarts? Kellog's took an awesome thing and turned it into an epic fail. Which makes the decision to include Georgia Pop-Tarts more ironic. The WAC to become an ex-college football conference at end of 2012 season. The Western Athletic conference is throwing in the towel as a college football conference. The 2012 season will be the last for the conference weakened in the past several years by the departures of team like Boise State, Nevada, and Fresno St. The WAC is not dead – not yet – but inevitably, WAC football is: After 50 years in business, interim commissioner Jeff Hurd confirmed Monday that the Western Athletic Conference will drop football after the upcoming season, officially pulling the plug after two years of steady attrition. With that, the WAC becomes the first Division I conference to call it quits in football since the Southwest Conference dissolved in 1995, and the first casualty of the most recent round of conference realignment. The WAC will continue as a conference in other college sports, but the remaining schools will have to go find another conference to join, if they already haven't. Covering Dixie Like Mildew: Tyrann Mathieu, Jarvis Jones, Derek Dooley, and more. Miss St. asst. coach resigns. Roll 'Bama Roll looks at the 2012 Alabama defense. Team Speed Kills does the "predict week five of 2012 season" using NCAA Football '13 gimmick. I get a funny feeling the Georgia-Tennessee game isn't going to go quite the way TSK says it will. 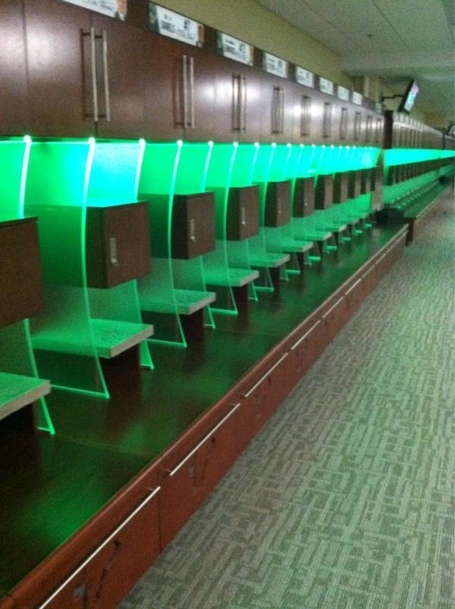 South Florida's new locker room looks like a row of Xboxes. This is South Florida's recently remodeled locker room. As you can tell, it looks a little...different. I may be wrong, but it seems that whoever handled the remodeling took their inspiration from an Xbox 360 console. Not that there's anything wrong with that, but that neon green glow is just creepy. It looks like the Bulls were getting more for Cosmic Bowling than for a football game. That Big East Roundup: Kyle Flood, and more. Card Chronicle profiles Louisville wide receiver Andrell Smith. Cardiac Hill previews Pitt's offense. Nick Saban reinvents the language of college football. While not busy winning two of the past three BCS titles, Alabama head football coach Nick Saban has apparently been introducing new terminology into college football. Or at least terminology that originated from his days as a lowly defensive coordinator for then Cleveland Browns HC Bill Belichick. Obviously, using money terms has proven successful for Saban and Alabama. Of course, the "money" players can't (officially) earn any money doing their job. But that's neither here nor there. Big Tentacles: Danny O'Brien, Kyle Prater, Urban Meyer, and more. Least shocking news of the day. Coaches Hot Seat previews Michigan State's 2012 season. If you smell what the backup iscooking. Donnovonn's Brain (not to mention the rest of him). A Lion Eye profiles Illinois running back Donovonn Young. Welcome to the Fallout: USC on top. McGee suspended, Lacy injured, and more. Trojans trump Tide and Tigers. Welcome to the Fallout: Denard Robinson, Andrew Maxwell, and...Clinton-Dix? Michigan quarterback Denard Robinson couldn't beat Usain Bolt. Is Andrew Maxwell as good Kirk Cousins? Arizona State assistant coach profile of the day. Lake the Posts ponders Northwestern starting its own "Wildcat Network," at least in some kind of Internet form. Covering Dixie Like Mildew: Johnny Manziel, Auburn, recruiting, and more. War Blogle suggests that Sports Illustrated's decision to put Alabama quarterback A.J. McCarron on the Southeast regional cover for its college football preview issue will mean that Auburn could win the 2012 BCS title. SI put Alabama on the 2010 CFB preview issue, the year that Auburn won the BCS title. Don't hold your breath. Matt Barkley on cover of Sports Illustrated. Big Tentacles: Urban Meyer, Michigan, and more. A Mike Leach bobblehead doll? Of couse there is. Mark Richt talks about his facial hair. Big Tentacles: Danny O'Brien, Michigan, and more. Is Mark Richt growing a beard? 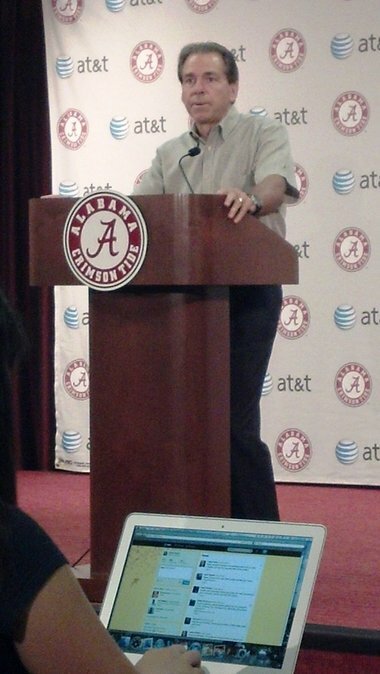 Nick Saban busts a rant on preseason predictions. Michigan freshman OL lets his inner redneck out.